Meet This Year's Gerber Baby. She's First of Hmong Descent. On a warm April day on the campus of Fresno State, the woman with short hair, wearing jeans, a T-shirt and Bulldogs jacket appears to be just another student. Or, maybe a hip professor. She’s not. Irma Olguin Jr. is the co-CEO of Bitwise, a downtown Fresno company that has turned into a real estate and technology company helping revitalize an oft-overlooked part of the city. “It’s hard to describe what we do, because we run 14 different businesses,” says Olguin, who was at Fresno State that particular day to deliver a lecture. Eventually choosing the University of Toledo, she spent the summer collecting cans to afford the Greyhound ride out of Fresno. Bitwise, according to Olguin, has three main sectors: writing software (under the Shift3 brand), teaching code (Geekwise Academy), and real estate in downtown Fresno. Her story is much more than a rags-to-riches tale. A chance moment at school led her out of the fields of Caruthers and into a career as a highly-respected woman in technology. She’s picked up awards recognizing her commitment to expanding high-tech opportunities for all and for her commitment to revitalizing downtown Fresno. Olguin is a woman in demand. Earlier this month, she celebrated a primary night victory in San Francisco with Gavin Newsom, running for governor. She serves on his technology and innovation committee. Last year, Olguin spoke to the Society of Women Engineers. “Irma inspired everyone to see the world as an opportunity for trial and error,” the group recapped on its website. On June 28, she will be a panelist at the Women in Business Summit, hosted by the Fresno Chamber of Commerce. Back in April, at Fresno State, Olguin shared her story to students from the Lyles Center for Innovation and Entrepreneurship. Nearly 100 people, from students ready to graduate to tenured professors, gathered at the North Gym. Just like her fashion choices, Olguin’s life story is unconventional. Olguin grew up in Caruthers, a town of 2,500 located 15 miles south of Fresno. Hard work in the fields did not translate to wealth and prosperity. The Olguins worked for others. Irma grew up with her mom, dad, and one brother. Each child is named after their parent. Her “junior” title was a parental decision. Her brother is named after her dad; she is named after her mom. Caruthers, she described, revolved around ag. As a youngster, she helped roll raisins as her family worked on a farm. And, like many kids in Caruthers, she looked forward to eating the corndogs at the fair. Olguin wanted out of the fields but initially kept her goals simple: work retail at Ace Hardware or Subway. If she put in enough time, Olguin thought, she would climb up the company ladder. But Olguin also had doubts about a life beyond Caruthers. “Maybe college isn’t for people like us,” she recalled her father saying. An opportune moment at school helped Olguin discover higher education could be her future. She heard an announcement over the school PA system inviting students to take the Pre-SAT. Irma jumped at the chance, but it wasn’t the college preparation that interested her. She scored well, leading to colleges sending her recruiting letters. Though he didn’t want to discourage her, her father raised the realities about the high cost of higher education. Not even partial scholarships to places like St. Mary’s or USC could help her achieve the dream. They were too expensive. Olguin flipped through the university catalog. She saw a picture of a glass building. She thought it was pretty. That’s how she decided to be a computer engineer major. Then full-ride offers came from Oklahoma and the University of Toledo. She chose the latter because they offered her money for food as part of her scholarship. But she still had to spend the summer collecting cans to afford the Greyhound ride out of Fresno. “The reality is growing up in these rural towns, is that bus ticket … is what stops you sometimes from picking up these opportunities. It’s a really real thing,” Olguin says. Embarking on the cross-country bus, Olguin left with $25 in her pocket and a world of opportunity ahead. But when registering at Toledo, she didn’t know what her major was, no less what a major was. “Bitwise is a place for everyone. It’s inclusive. It doesn’t matter your political beliefs, your race, gender, sexuality, or any of those things. We are humans first. 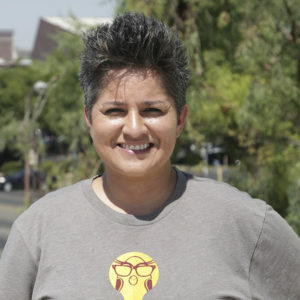 Bitwise is about humans and being kind to them.” — Bitwise co-CEO Irma Olguin Jr. Her brother teased her about her selection when she called home, saying she might not be smart enough. “So, my mind was made up. If your brother tells you (that) you can’t do something, that’s what you are going to be,” she says. Olguin tried to keep up in class, describing herself as a brown girl from the raisin fields of Fresno in class with really smart people. She soaked up all she heard and saw. Computer engineering led to opportunities working for large companies. Still, she didn’t know what she wanted to do with her life. She moved back to Fresno after graduation. The work didn’t satisfy her. She tried teaching. And that led to an opportunity at the Central Valley Business Incubator. “I finally knew what I wanted to do with my life. This is it. This is how I’m going to spend my time,” she says. Olguin enjoyed working with entrepreneurs, making their dreams come true with her technological skill. She even started some tech companies of her own, which led to another meeting that changed her professional life. Needing help with intellectual property issues for the three companies she ran at the time, Olguin met with local attorney Jake Soberal. The two realized they had many common goals. Soberal says he met his match when he formed the company with Olguin and two other investors. Olguin and Soberal became equals, sharing the co-CEO title. Soberal says their disparate backgrounds are an asset. He grew up in what he called a “privileged” upbringing in Clovis, before embarking to the University of North Carolina, then law school in southern California. “The contrast is really fun,” Soberal recalls. “On a pragmatic level on how we do business together, we tend to acknowledge each other’s strengths really, really well. It’s pretty obvious to us when there is a task or project on who the right person would be. Olguin wants Bitwise’s culture to be as varied as the colors of the company’s new Beehive building in downtown Fresno. For her, it all comes back to tech, and teaching others. Olguin isn’t shy about calling herself a tech geek. After all, her coding company is called Geekwise and she lists herself as “professional geek” on LinkedIn. “The most important thing we do (at Bitwise) is give young people an entry point into the technology industry,” she says. Olguin’s advocacy for women in technology has earned her awards and admiration. “Thanks to Irma’s leadership, the tech industry is recognizing the opportunities and advantages of locating or expanding their operations in Fresno. Irma’s leadership in the tech industry is inspirational,” Assemblyman Joaquin Arambula (D-Fresno) said when awarding her the 2017 District Woman of the Year. Olguin’s other passion, besides tech and inclusion, is bettering downtown Fresno. The company put its money where its mouth is. They moved their operations to the South Stadium location on Van Ness and Inyo streets. 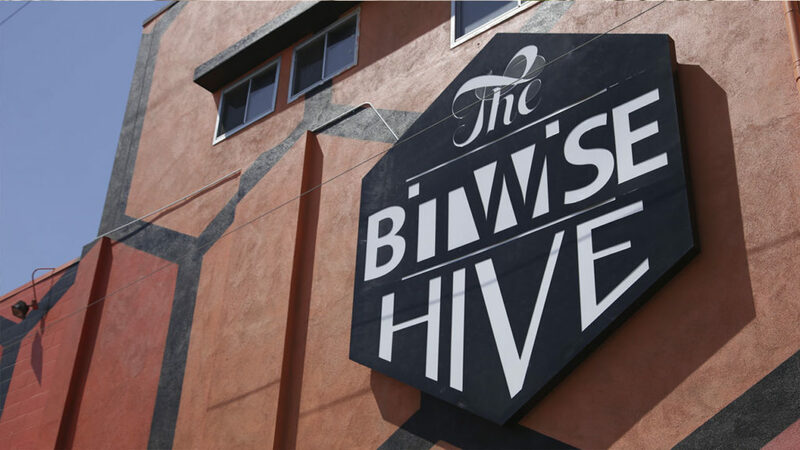 They bought numerous real estate locations in downtown Fresno to make them uniquely Bitwise, including The Bitwise Hive (the 54,000 square-foot building’s grand opening is June 30). “It’s the place we feel we can have the greatest impact. We truly believe that if we have a healthy urban city center, that will bleed out to the other areas of town, including where I’m from, all the way to the rural towns like Caruthers.” — Irma Olguin Jr.
“It’s the place we feel we can have the greatest impact. We truly believe that if we have a healthy urban city center, that will bleed out to the other areas of town, including where I’m from, all the way to the rural towns like Caruthers,” Olguin says. The goal is to have 2 million square-feet of building space for technology tenants over the next five to eight years. Right now, she says the company is at a half-million square feet. Last month, the Fresno Downtown Partnership awarded Olguin and Soberal the Al Allen Leadership Award. Just as Olguin began to speak, the mic cut out. “There’s no irony greater than the tech dropping out just when the tech company walks on the stage. That’s not an omen,” she says. “We have plenty of good things in store. Excellent article that shines a spotlight on the amazing work Irma & Jake are accomplishing. Their partnership leads by example & the message is clear. Kindness to our fellow humans & willingness to use the strength of our diversity to bring us together accomplishes opportunity for many.